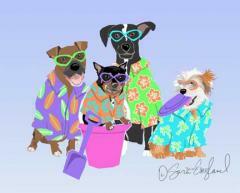 Time for the Beach features a fun group of dog pals, in your favorite dog breed, ready to enjoy the sun and the beach! 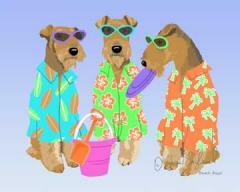 This is a fabulous print any dog lover! Fun in the Sun! Prints are available in 3 different sizes and can be purchased either double matted with a thin black inlay or double matted and framed in a beautiful black frame with a matte finish. Double Matted Only: 11" x 14" - $42.00; 16" x 20" - $65.00; and 20" x 24" - $85.00. Double Matted & Framed: 11" x 14" - $115.00; 16" x 20" - $155.00; and 20" x 24" - $185.00.